Nespresso coffee machines are perfect for making small espresso sized or lungo sized coffees. But one frustration is not being able to use a full sized mug or tall glass with your Nespresso machine. 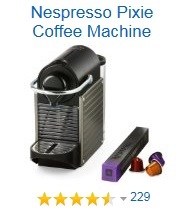 Are there any Nespresso coffee machines that can fit a large mug? If you’ve got a Nespresso pod coffee machine you will know they make fantastic small coffees. The lungo option allows you to make 110ml of Nespresso coffee but what if you want to double up into a larger glass or mug? The immediate problem will be that a normal sized mug simply won’t fit between the coffee dispenser and the drip tray on most Nespresso machines. You can try holding the mug at an angle but this doesn’t really work satisfactorily. Are there any Nespresso machines that can fit a full sized mug? Yes – The only Nespresso machine I’m aware of that can currently take a tall glass or full sized mug is the Nespresso Citiz machine. The Nespresso Citiz has a foldaway platform above the drip tray. If you fold this platform up, there is space between the dispenser and the drip tray for a proper sized mug. You might need to use a couple of Lungo pods to fill your tall glass or mug, but you can then enjoy a full sized coffee from your Nespresso machine. Helping you with all your questions and problems with pod coffee systems.